We can finally leave March 2018 behind us as we turn the calendar tomorrow on Easter Sunday. Looking back, the month brought three nor’easters – dumping enough snow to make it the fourth snowiest March in Boston, MA. March placed second in terms of snowfall totals in Worcester, MA. Many of you will long remember March 2018 for its snowstorms but what about the unseasonable cool temperatures? Average March temperatures will likely finish colder than last month! February 2018’s monthly average temperature finished at 38.1 degrees. As of yesterday, the average monthly temperature for March so far is at 36.9 degrees but the 64-degree high yesterday in Boston certainly helped in closing the gap. Let’s get to the Easter Weekend forecast. Today is the pick of the weekend under plentiful sunshine. Expect highs in the 50s south but mid to upper 40s north. Tonight, more clouds will stroll in ahead of a disturbance from the west. This weak disturbance will dissipate over New England but will bring a quick morning sprinkle on Easter. A few showers mixed with flurries are possible for the North Country but these showers will clear out in time for your Easter Sunday afternoon plans - so it will not be a washout by all means. It will be breezy - so hold onto your Easter hats. Take advantage of the nice weather this weekend since the upcoming workweek is the first full week of April, and as the saying goes, “April showers bring May flowers.” That expression will ring true for the first half of the week. Also expect a slight cool down.Plus, we’re keeping an eye on a clipper that will skim to the south of New England and could bring some light snow showers early Monday morning for southern most parts of New England. However, the only accumulation will most likely be on grassy surfaces in Connecticut, Rhode Island, and southeastern Massachusetts. This quick-moving system will be out of here by late Monday morning with our next system knocking on our doorstep Tuesday. That will bring widespread precipitation across New England and last through Wednesday - and will mostly be a rain event for southern New England. 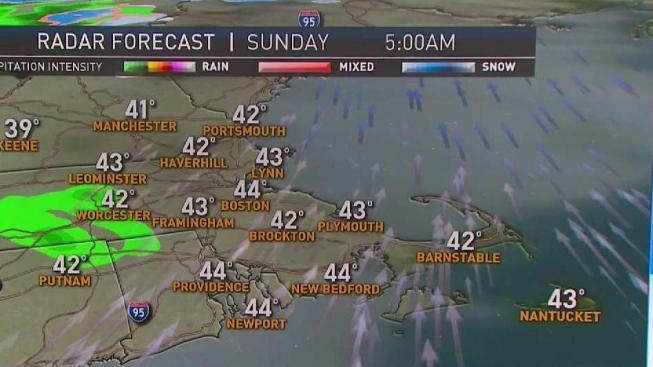 In northern New England, you could see some pockets of wintry mix before changing over to rain by Wednesday afternoon. Thankfully, the showers slide out just in time Thursday afternoon for the Red Sox Home Opener against the Tampa Bay Rays. That game will be under partly sunny skies and temperatures in the mid-40s. The rest of the 10-day forecast remains in the upper 40s with a chance for another wintry mix early next Saturday. Be sure to keep an eye on the forecast by downloading the NBC 10 Boston / NECN app for the latest weather alerts right to your phone. In the meantime, have a wonderful holiday weekend and safe travels.